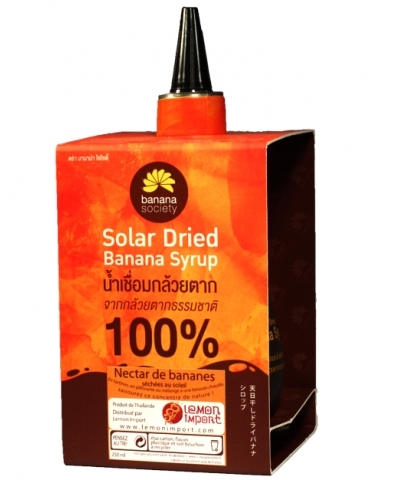 Produced only from dried bananas dried by the sunlight I. Thailand, our nectar looks like honey & is unforgettable when spread on a slice of bread, in a hot drink or when making bakery. A delicacy from nature, bringing many nutrients, to maintain one's wellness & vitality. Ingredients : sun dried banana 100%. Banana nectar. 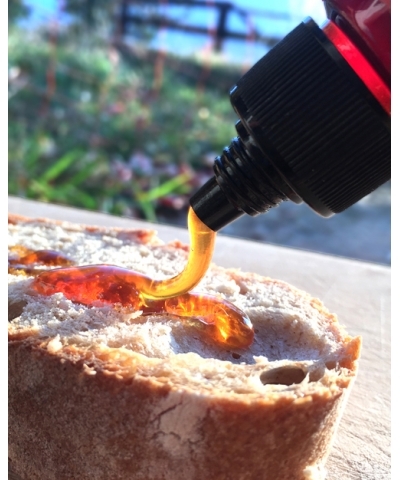 As unctuous as honey, but with its own unique taste, it may be used spread on a slice of bread, to sweeten a drink or to make bakery. 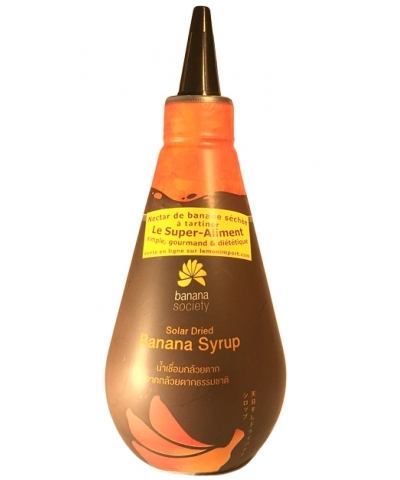 However, our banana nectar is full of nutrients: vitamins, minerals & amino acids. That's why we consider it as an allied food to active days or to practice sport. Our Bananas from Thailand are growing without industrial fertilizer nor pesticide in Phitsanulok province. During drying process under translucent parabolic domes, they are laid down on bamboo mats, away from insect and any contamination brought by wind. Zero substance added ! When dried, the only added substance to produce nectar is water. There is no color, no preservatives, no flavor, no sugar added. Once packed & labeled, Lemon Import deals with the import from Phitsanulok to Quaix en Chartreuse, according to the regulations. Nutrition facts : one spoon of nectar equals 3-4 bananas but doesn't bring any fat nor cholesterol. Contains quick-release sugars & potassium. Contains vitamins B, B1, B2, B3, B6, B12 & C.
Contains fibers. Brings prebiotic provided by fructooligosaccharide. Life on shelves : 1 year. Starting from a family business, our producer is the first in Thailand to have decided to improve the production quality with innovative methode to reach international standards. Some investment has been required to build new infrastructures & to give more skills to the staff but it was worth it. If the drying process under glass parabolic dome has been able to focus solar radiation on the drying surface, it gives above all a protection to drying fruits against any contaminant brought through the wind. This quality control level is guaranteed by the GMP Codex & HACCP certification. K Chanama, who is now running this family business in Phitsanulok. 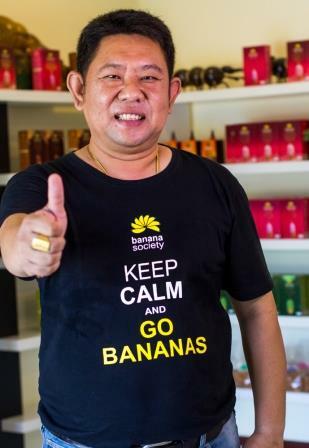 To know more about Banana Society products, see our dedicated News published after visiting the production site on the 30th of October, 2015.